Shona Malcolm, secretary of the PGA in Scotland. Hamilton Academical’s Superseal Stadium is being transformed into a golf zone on Sunday as 30 youngsters, some from families with addiction problems, are given a taste of the sport for the first time. The M&H Logistics StreetGolf Fun Day, the first event of its kind in Scotland, is a joint initiative involving the PGA, Scottish Golf and the Golf Foundation. It will see the Scottish Premiership club’s stadium become a pop-up golf venue as the youngsters aged from eight to 11 take part in 10 different challenges. The event follows on from Glasgow-based M&H Logistics, which is owned by former Airdrie chairman Tom Wotherspoon, becoming title sponsor of the Scottish PGA Championship for the first time last year. 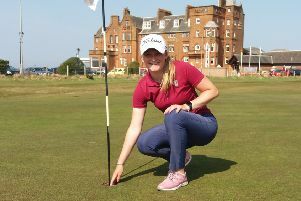 “We are delighted to add value to our partnership with M&H Logistics by supporting the company’s community activities through a fun golf experience for young people who might not otherwise have the chance to try the game,” said PGA in Scotland secretary Shona Malcolm. “By introducing M&H Logistics to the Golf Foundation and to Scottish Golf, we have been able to facilitate an innovative cross-sector, cross-organisation and now cross-sport working arrangement in Scotland which clearly demonstrates the value of collaboration in meeting the objectives all parties. The youngsters taking part will include Hamilton Academical youth academy members and children from Blameless, a charity that has been formed to help the children and families of those suffering with addiction.